We went to a potluck chaat party hosted by one of our friends, consisting of bhel puri, pani puri, pav bhaji etc. (all delicious junk food). 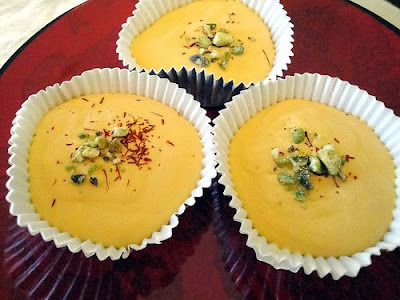 I made my wife's special mango kulfi, which is versatile in that it can also be served as a pie. The traditional way of making kulfi (frozen sweet dessert similar to ice cream) is to slowly cook whole milk and sugar, caramelize them till the milk volume turns to at least half its original size, adding fruits or nuts and freezing them in molds or small pots (matkas). Being such an arduous task, I stuck to a much easier method thanks to my wife’s superfast recipe. For lovers of mango desserts or any kind of frozen milk dessert, this is one dessert that you should try out as soon as you can. All you need is a trip to your local Indian grocery store and a few other ingredients, and you can make a batch of these beauties. Thaw the Cool Whip for a while so that it is a little soft, by keeping it in normal room temperature for 10 – 15 minutes or so. In a large bowl, mix the mango pulp, sweetened condensed milk, and the Cool Whip and blend them all together with a hand blender, until smooth and creamy. Pour 1 ½ ice cream scoop full’s into each muffin baking cup, garnish on top with crushed saffron and pistachio nuts, and freeze for around 3-4 hours. Serve with pride, knowing fully well that you have a winner at your hands and people will be clamoring over you for the recipe J.